Grande Cuisine Systems Inc. – We are the exclusive North American distributor of ISECO regeneration equipment. 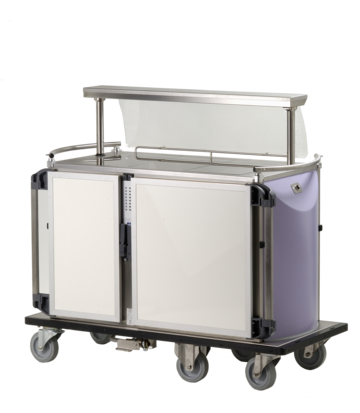 At Grande Cuisine Systems, we are passionate about delivering the best possible meals to patients and residents of hospitals, long-term care facilities, nursing homes and other institutions. We represent ISECO St-Phal, who manufacture the best quality retherm equipment in the world. While many of our competitors depend on convection to reheat / boost the temperature of meals, ISECO’s equipment uses thermocontact technology exclusively. Convection retherm blows air at 130°C/265°F throughout the entire “hot side” of a tray cart, heating the inside of the cart, the air, the plates, the plate covers, and the entire hot side of the tray to 130°C/265°F in order to get the meal to a suitable temperature. Thermocontact is different: it only heats the bottom of the tray, which in turn heats the bottom of the plate, and hence the food on the plate. • With thermocontact technology, the food keeps its original moisture and organoleptic qualities (appearance, smell, taste, texture), since it’s not being blasted by air at 130°C/265°F. Because thermocontact retherm is so gentle, meals come out virtually indistinguishable from freshly made. • Thermocontact retherm requires no moving parts, while convection requires multiple fans blowing hot air at 130C. As a result, carts which use thermocontact technology are significantly more reliable than convection and therefore cost far, far less to maintain. They also have significantly longer economic life than carts using convection technology. • Thermocontact technology uses about 40% less energy than Convection to accomplish the same job. Energy cost savings are significant. • Less energy translates to virtually no waste heat. 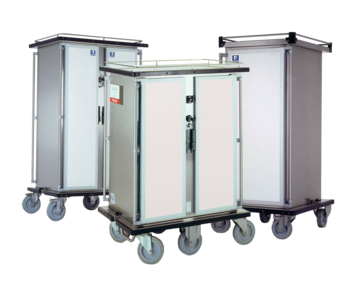 With convection technology, the waste heat has to be air-conditioned out, or the rooms where the carts are being rethermed become uncomfortably hot. Usually, people think that better quality costs more money. In fact, with retherm the opposite is true. 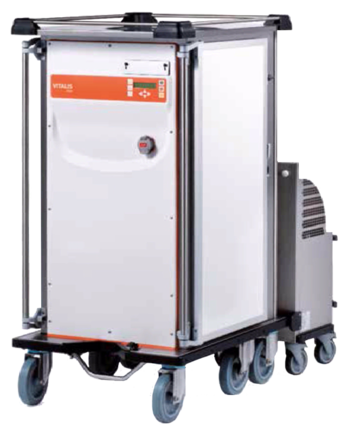 Our competitors who use convection technology could give you their retherm carts for free, and it would still cost you more just in maintenance, energy and air conditioning over the life of the carts than ours would, including all costs. When evaluating alternatives, look at all the costs. Don’t be duped by a low purchase price; consider meal quality, patient/resident satisfaction and all the costs before making a decision. Fresh & High Quality Food. Better Taste, Less Waste.